Do the election season blues have you down? Don’t think you can possibly handle one more political commercial, debate, or phone call? I have the solution. 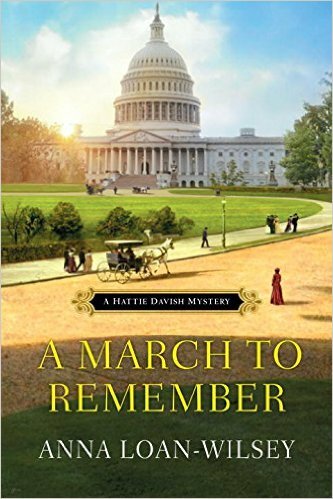 Pick up a copy of Anna Loan-Wilsey’s new book, A March to Remember and read a fun, fictional account set in our nation’s capital, Washington, DC. There was a lot I liked about this book. One of those items was the main character, Hattie is a list maker like me! She would write out and organize her thoughts throughout the book. So in honor of Hattie (and list makers everywhere), here are my top five favorite takeaways from this historical cozy mystery. I appreciated that this book was easy to follow. This was the first Hattie Davis Mystery I have read. Sometimes coming into a pre-existing series in the middle is tough. There are so many characters with old storylines being brought up that you feel left out. I didn’t feel like I was “late to the party” at all with this series and I appreciated that. It made me want to go to Washington, DC. In my early married life, the hubby and I lived in the greater Washington, DC area. I enjoyed the imagery of the city this book painted. It brought back fond memories of days past and made me itch to start planning a family vacation to our National’s Capital sometime in the future. I immediately connected with the main character. For me, connecting with the protagonist on some level is critical to my enjoyment of a book. I connected with Hattie’s determined and organized personality right away. She was submissive, yet confident. Discreet, yet bold. There were a lot of levels of this character that worked well for her. It made me want to learn more about history. When one reads historical fiction, you many times find yourself wondering just how much about the backstory is factual. Several parts of the book drew out this curiosity, causing me to head over to ever trusty Google and search for more information on the historical events that the story used as its base. It made me want to read more of Hattie’s adventures. By the end of the book, I was including the first books in this series on my Goodreads reading list. I look forward to continuing onto other adventures in this series and seeing what trouble Hattie manages to find in other books. Want to read it yourself? For FREE? Enter this super awesome giveaway and win a complete autographed set of all five Hattie Davish Mystery Books! I would like to thank Great Escapes Book Tours and Kensington Publishing Corporation for the complimentary copy of this book in exchange for my honest review. Thank you for hosting me today on Grace, Gratitude and Life and for your lovely review. I’m so glad you enjoyed the book! I enjoyed reading your Hattie-Davish-inspired list of reasons to read this book! Anna Loan-Wilsey is indeed a talented writer who makes creating relatable, engaging characters look easy. I have the book on Kindle (a gift from one of Anna’s fans) and I can’t wait to start reading it! Congratulations, Anna, on your new release! Thank you, Amy! Hope you like this one. Thanks for stopping by and checking the review out, Amy. Hope you enjoy this book as much as I did! I really enjoy reading historical mysteries, especially set in Washington DC. Would love to read this series. Definitely adding to my TBR list. It’s a great one for the reading list, Dianne. Make sure you enter the giveaway and you have a chance to win a free copy of all five books in this series! Thanks for stopping by the blog to visit us. Come again soon!